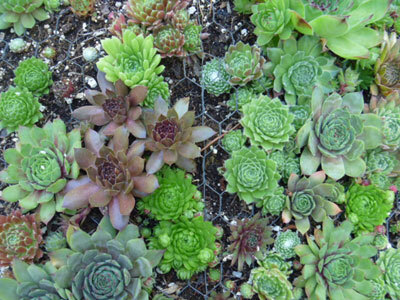 Once you learn the tricks of how to grow Sempervivum you'll wonder why it seemed so difficult. Sempervivum for all their exotic appearance are really fool proof. There are a few rules and requirements, but honestly, you’ll find these beauties very relaxed in their needs. For all their ability to withstand cold, windy and drought conditions, one thing they can't take is wet soil. They'll die every time if the roots are waterlogged for too long. If you have sandy or gravelly soil, your hens and chickens will thrive; clay soils can be amended with coarse sand, pumice or lava rock to create the essential drainage. Manure based or muck type soils will not provide enough drainage for these types of plants - the only solution is a raised bed with the well drained soil they need. A rock retaining wall is the ideal situation; plant the many different kinds of Sempervivum all together in the nooks and crannies in full sun. Mulch with lava rock or other mineral mulch to drain moisture away from the crown. 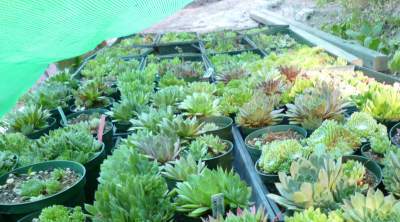 That’s it for growing Sempervivum in the ground – very simple and undemanding, despite their appearance. 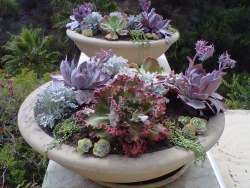 Sempervivum in succulent crafts or root planters are a different story, as in most cases the soil will be almost non-existent and there is air all around the succulent topiary, succulent mosaic or containers for succulents. Using a moisture retentive soil in these kinds of situations will be fine. To safely over winter your crafts and ensure the survival of the plants, even though they’re perfectly cold hardy when planted in the ground you’ll have to heel them in or put the craft in an out of the way bed in some leaves. 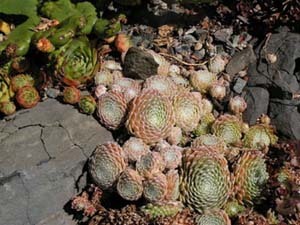 Find out more about how to overwinter succulents here. Only put those in their winter storage area after the first few frosts, as mice and other vermin can do a lot of damage on the tender succulent growth. Don’t make the mistake of coddling them or bringing them in to a warm house; they much prefer being left to their own devices and allowed to adapt to the outside conditions. They will emerge from their winter cold rest period with renewed vigor and vitality. Sempervivum under shade cloth? What's up with that? One thing I've found this year with its strange and confusing weather patterns (extreme rainfall, then excessive heat) is that some of my Sempervivum planted in shallow flats and larger pots suffered greatly when in full sun. They paled out, even with some fertilizer, and the only thing that helped them look (and perform) better was some shade, provided by shade cloth with 50% shade. Who knew that these extremely tough plants would show such stress? My theory is that they can take heat, or bright conditions, but not both at once - which actually makes sense as they are a high mountain plant, not a desert plant. Do your Sempervivum have issues? Find out more about Sempervivum problems here. As easy as they are to grow, once you get some you’re guaranteed to want more. Buying or trading via a succulent swap online is a great way to increase the varieties you have. Shipping them is really easy – luckily, they don’t mind being sent in the mail bareroot, and once you unpack them and put them in the garden they quickly recover from their journey. 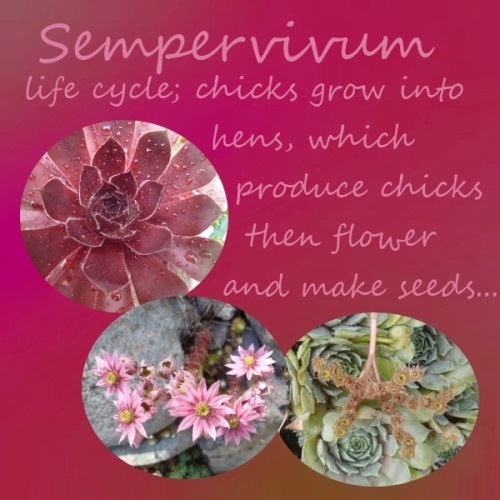 What's the Difference Between Sedum and Sempervivum? 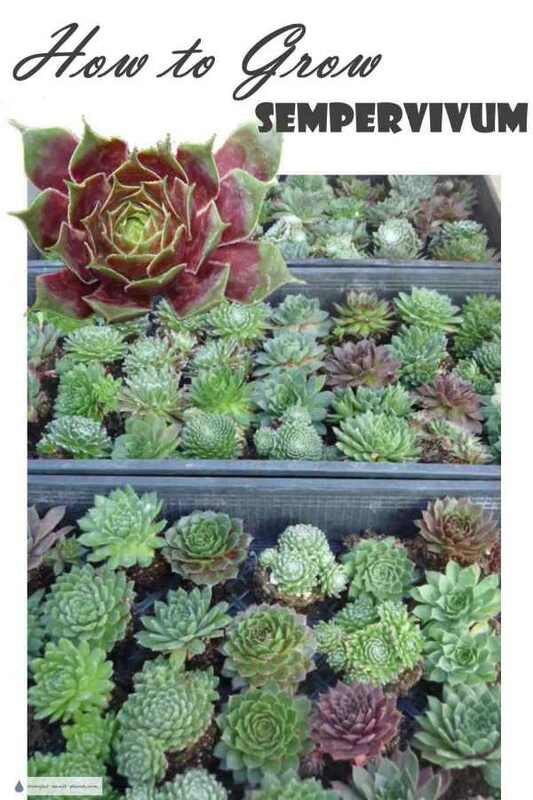 What's the Difference Between Sempervivum and Echeveria?